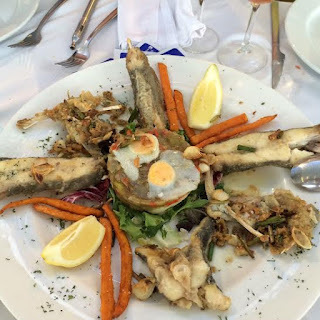 At the restaurant, LaTaberna de Lucia, by the marina in Santa Pola the fish of the day is on display in a chilled cabinet from which you can choose. When we visited in June they had a fish with the distinctive “thumbprint” which suggested it could be John Dory which I knew in Spanish as Pez de San Pedro. The waiter said it was Gallo, which I found strange and confusing as I knew gallo as Megrim sole and this was not any kind of sole; although flatish, it was not a ‘flatfish”. The sharp spiny dorsal fin should have confirmed my suspicion that this was John Dory. I questioned the waiter further, testing my shaky Spanish vocabulary and his “poco” English and he said “chicken fish” which seemed logical as gallo is cockerel in Spanish, but I remained confused. Back home, however, Alan Davidson came to the rescue (eventually). I looked in the index of “Mediterranean Seafood” and “gallo” was listed as Whiff, Sail-fluke or Megrim Sole as I had thought. Looking at the section on John Dory, however, Davidson gave the Catalan name as Gall and although the usual name in Spanish is San Pedro and in French is Saint-Pierre, he gave an alternative French name, Poule de mer (sea chicken). Davidson’s “Tio Pepe guide to the seafood of Spain and Portugal” was more forthcoming. Gallo in the index referred to the entries for both John Dory and megrim sole. Gallo appears to be the name for megrim sole but gall or gallo is the Catalan name for John Dory. The local language in the Santa Pola area is Valencian which is very similar to Catalan. I also have a rather ancient book (1957) “Spanish Cooking” by Elizabeth Cass (originally published by Andre Deutsch but reprinted in 1968 for The Cookery Book Club, which gives the name gallo as well as San Pedro for John Dory. Dr Cass describes gallo as the name used in Andalusia. Just to add confusion she gives Gallina del Mar (hen of the sea) as an alternative name for Gurnard but confirms that the widely used term gallo is a member of the sole family i.e. megrim. Another fish, with a similar name, gallineta, is mentioned which she describes as a variety of rockfish related to rascasio (scorpion fish). Davidson’s Tio Pepe guide confirms that gallineta, (gallineta rosada in full) is the French rascasse rose or slender rocklfish in English. Leaving aside confusion over names, the long and the short of it is that John Dory is delicious and widely available in both Spain and the UK and I can’t wait to try my hand at cooking it. Unfortunately, John Dory has a lot of spines and waste so a reasonably sized specimen yields little flesh and when I looked in my local fishmonger in Hove last week, John Dory was £17 per kilo and one fish weighing just over a kilo would have produced only two fillets, albeit of a generous size, so I am waiting to see it on sale in UK at a much lower price or waiting till I return to Spain. In the meantime I would welcome any suggestions for recipes.